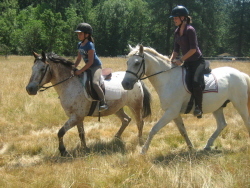 We have been operating equestrian summer camps for girls since 1981, first as the Mendocino Equestrian Center on the northern California coast, later (about 1988) as Three Gaits in the San Francisco Bay area. 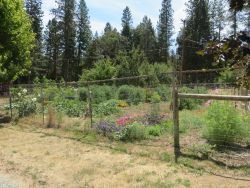 In 2007 we moved yet again to our current location near the scenic Rogue River in beautiful southern Oregon, where the air is clean and the grass is greener! Our equipment and the facility are first class. We take only a small number of riders per session (typically six with a maximum of ten) in order to ensure personal attention. The campers sleep in the large 35-foot RV or 70-foot mobile home "bunkhouse", depending on the number attending. The most recent photo galleries are now on our Facebook page; click here to visit. A little about the camp routine: First and foremost, since this is a Riding Camp, we won't be shootin' arrows or making lanyards. 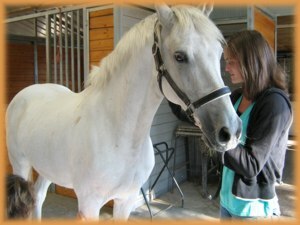 You will spend lots of hours riding horses, and learning about horse care. 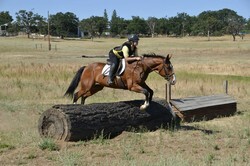 The daily schedule includes a long formal lesson in the morning, with instruction in dressage and/or jumping. After lunch, the girls often choose another lesson, or on the lighter side, a hack through the wooded trails, games on horseback, or just riding around in the pastures. Barn management and stable chores are also a part of the daily schedule. Evenings are pretty much free-form; We might decide to ride yet again, taking advantage of the long daylight hours. Or we can review videos from that day's riding, play games, watch movies (usually featuring horse related subjects), or simply sit around reading or talking. 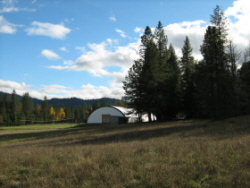 Occasionally we'll take field trips to other barns, horse shows, go jumping at a local cross country course, or maybe visit the towns of Ashland (home of the famous Oregon Shakespeare Festival) or Jacksonville - a fun shopping experience. One afternoon we took a tour of Wildlife Images, a wonderful non-profit rescue nearby. 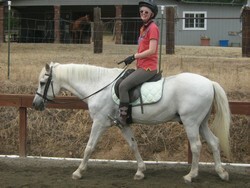 We are happy to accommodate both the serious and the recreational rider. 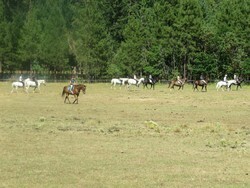 We have enough horses so that those who wish may spend long hours in the saddle without overtaxing the animals. 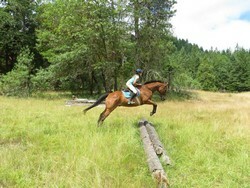 Our horses are safe and experienced, both on the trail and in the show ring. The meals are wholesome and healthy – as much as the girls will tolerate anyway – featuring organic, locally grown and chemical free foods whenever possible. We easily accommodate vegetarians. The child I sent to you at the beginning of July seems a distant memory compared to the confident, all-knowing young girl that just started 5th grade yesterday. Thank you for providing such a warm, safe environment where Lauren was able to spread her wings and thrive. Thank you for a wonderful week at camp. The girls enjoyed themselves, had very positive things to say about the experience, and are making plans for next year. I particularly appreciated your effort, Bruce, to pick up the girls last week on last-minute notice, the time I got to spend with Judy yesterday after I arrived at the unheard-of eight o'clock (grin), and the sense of place that I took away from my brief visit and the girls' accounts of the week. ...we've gotten the high points. The staff, the place, the food (! 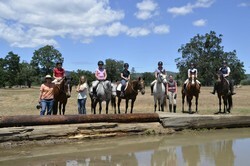 ), the riding, the horses, the schedule, the other campers. 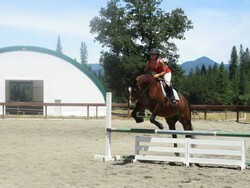 My daughter's first horse camp with Judy was at the age of six. The little tiny girl I dropped off on that first day came away eager for the next day, and the next. Needless to say, that summer was booked solid with equine activities. I stood by helpless, not knowing thing one about horses. Judy assured me that all safety measures were practiced and calmed my fears. She was excited to take these children and turn them into little worker bees, grooming and cleaning tack. And into riders. 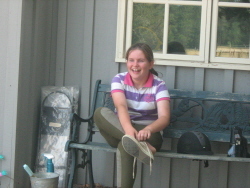 Eight years later, when I look back on all those years of horse lessons and camps, I can't help but reflect what a huge part Judy played in them. If it were not for her expertise and experience in dealing with small children (and the fears of their non-equine parents), there is no doubt that my daughter would not be riding today. Judy saw us through many lessons, camps, and even the purchase of our first horse. She pretty much held our hands and led us through horse ownership. 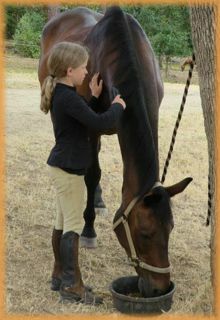 She instilled in my daughter an immense love, and more importantly, respect for the horse. 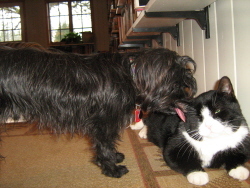 Judy taught first and foremost the care and responsibility of the animal. Then she taught how to ride. Although Judy moved out of state, my daughter still asks to attend her camp each year. 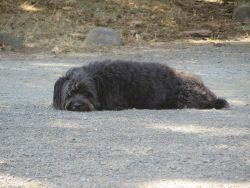 And whenever there is a lull in her school year, she thinks of Judy and wishes she could just jump in the car and make the trip to see her. 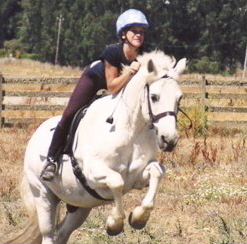 In reflection, it has become clear to me that Judy was more than just a riding instructor. 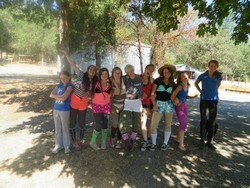 It's the best horse camp ever! It is wonderful to find this website and know that Judy is still hard at work inspiring young campers. 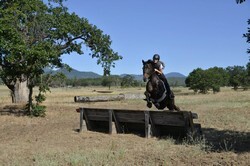 My adult daughter was fortunate enough to have the opportunity to learn so much from Judy and the horses. Judy gave all the students the correct and solid fundamentals, the subtleties of good riding, and so importantly, the deep respect and understanding of the animals with whom they were teamed. It was an important part of her life experience for my child to be educated by such an intuitive and trustworthy role model. 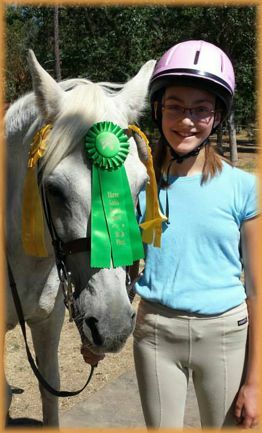 Judy has a great blend of discipline, fun and humor that engages her students and brings out the best in them, building confidence and self esteem along with riding skills. My daughter attended Judy's summer camp and it was one of the best experiences of her life. 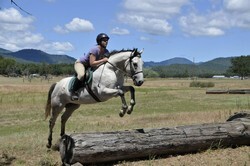 Although her riding improved dramatically, it wasn't just about the riding. The camp experiences ranged from mundane (tack cleaning) to thrilling (competing in a local combined training event) but she and her fellow campers loved it all. She is already talking about camp next summer. 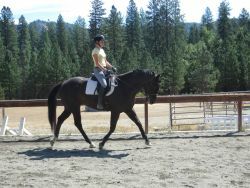 Three Gaits offers a well rounded experience to all it's participants. 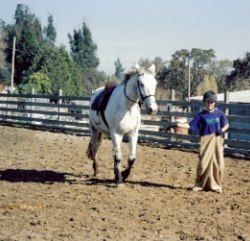 Judy Herman offers excellent instruction in dressage and hunter techniques while teaching your child respect and safety in all phases of horsemanship. Judy has successfully applied her broad experience to every task that will be taught your child. I have great respect for her quality instruction and her responsible and trustworthy character. 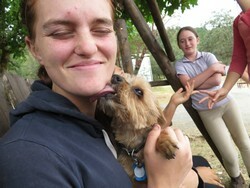 Our granddaughter has attended day camps with Judy in California and several week long camps in Oregon. Summer would not be summer if Hannah didn't spend at least a week with Judy at camp each year. As she reflects on her memories I can always expect a smile on her face and a sparkle in her eye as a story is shared. What fond memories our granddaughter will enjoy in later years. 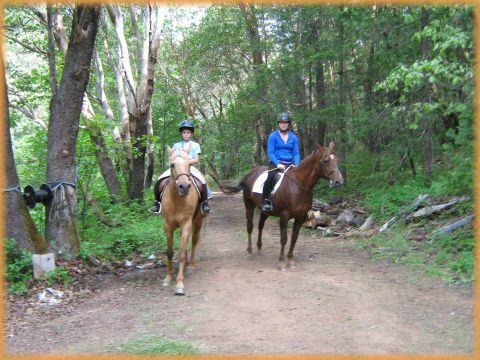 Judy Herman is dedicated to making your child's experience at Three Gaits fun and positive. Your child will create friendships with other campers and come away with lasting memories. 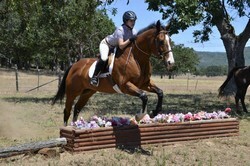 Judy's gift of pairing horses and riders by age and personality makes for a rewarding equine experience. 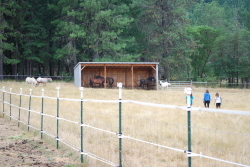 The children leave camp with a new confidence in themselves, and a love and respect for horses. 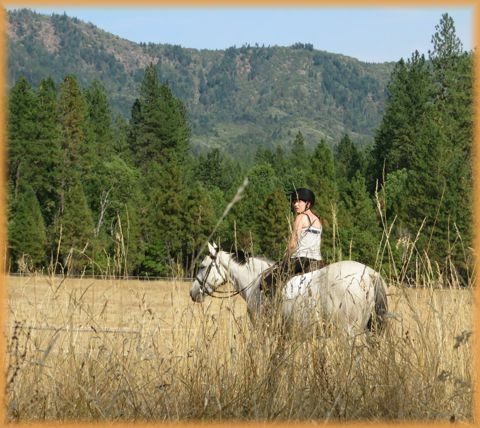 Last summer, my friend and I took our nine year old daughters along with our dogs up from the Bay Area to Southern Oregon for a week so that our daughters could attend horse camp at Three Gaits. Judy Herman, who runs the camp, was great! She personally taught our daughters from 9-1. They loved it! 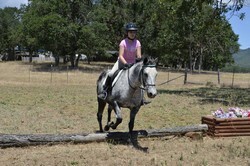 My daughter is a beginning rider while her friend rides twice a week. Nonetheless Judy was able to have them in the same riding group, because her assistants were able to give my daughter a little bit of extra attention to bring her up to speed. During the lesson, my friend and I were able to tour the local "tourist spots". Judy was very helpful in making suggestions, giving driving directions and finding us accommodations for our week-long stay. We observed the lessons on several occasions. The lessons were safe, fun and very instructive. 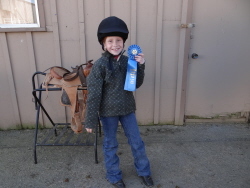 Although my daughter did not continue her lessons in the Bay Area (her friend did) she is now able to comfortably ride on the occasional horse ride we take on weekends. 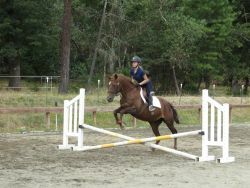 By the way, my friend and I, who are both inexperienced with horses, also took one lesson. We enjoyed the experience. 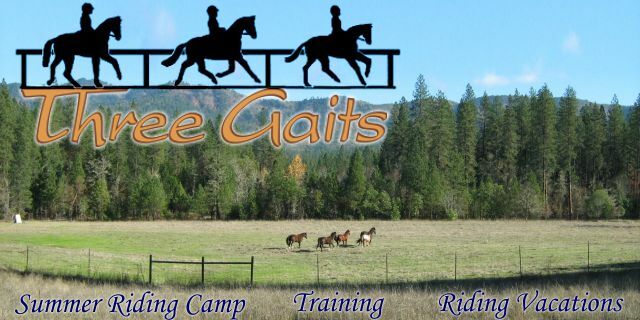 I heartily recommend a week-long camp at Three Gaits. It was a very relaxing vacation for us all. We are hoping to repeat the experience this summer. Copyright © 2008-2012 by Three Gaits. All Rights Reserved.